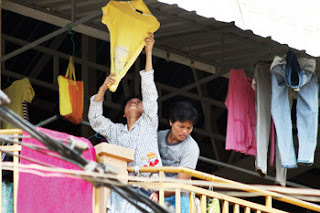 Female trainees preparing their clothes on the roof of T&P co ltd training center in Phnom Penh’s Sen Sok district last week. Lawmakers from the opposition Sam Rainsy Party visited the offices of the T&P Co Ltd labour recruitment firm where a 35-year-old trainee died on Sunday and where current trainees say they are being held against their will. Son Chhay, Mu Sochua and Ho Van met with company representatives and labour trainees to investigate claims of false imprisonment and to interview trainees who earlier this week were questioned by military police about conditions at the firm, located in Phnom Penh’s Sen Sok district. Son Chhay said after the meeting that the practices of some labour firms border on human trafficking. “They take people to the company and detain them for as much as three months, using force and intimidation,” he said. During the visit, Mu Sochua spoke to Srun Channang, 23, who said she had tried unsuccessfully to get permission to leave the company, where she has been living since December 12. “I want to leave, but my request was rejected,” she said. However, a company representative who declined to be named said the trainees are free to come and go as they please, but only if they are picked up from the office by a family member. “We do not deny anyone the right to leave here. They are free to walk and leave here if they have their parents to accept them,” the representative said. Srun Channang said, however, that the company has strict rules for leaving the grounds, requiring a staff member to accompany any worker who leaves. Son Chhay said today that the company, local authorities and officials from the Ministry of Labour could all be to blame for failing to regulate the firm and make sure that rights abuses are not being committed. He added that SRP officials would continue to speak to company representatives as well as Phnom Penh Municipal Court officials to make sure that women who want to leave the firm are allowed to do so. Cheng Monyra, deputy chief of Sen Sok district, said today that four women have asked to leave the company, but the district prosecutor and relevant officials have decided to delay a decision until further investigation can be conducted. “This case is still being investigated by the authorities and the court. The Sam Rainsy Party parliamentarians should not have come here,” he said.